The fire threat continues across the Lone Star State. The Texas Forest Service in College Station is the command post for not only those big wildfires in West Texas, but also for some fires in our area. It was a scene of smoke and dust off of Highway 21 West and Kuder Road in Western Brazos County. Crews were battling a blaze for a second time within just a few hours. "We've had fire that's burned about 5 acres. It's down in a ravine where a bunch of an illegal dump, wood, trash and so forth was dumped and it's been hard to contain," said Lt. Will Maddux with the Brazos County Precinct 4 Volunteer Fire Department. Maddux said the blaze was under control around 1:30 but mother nature had other plans. "Around 4:45 when it flared up again and we had to come back out and fight it actually got out of control on us again," he said. The dangerous drought conditions come as no surprise to Mark Stanford; he's the fire operations chief for the Texas Forest Service. "We think really we've entered new territory as far as fire danger goes the fuels are critically dry. Driest that we've seen in spring going back in recent history and an abundance of vegetation because of rains that we received late summer, early fall," said Mark Stanford with the Texas Forest Service. During News 3's time at the Texas Forest Service Emergency Operations Center they were providing resources for 14 major fires across the state. And the cause of most fires is preventable. "Over 90 percent of the fires in Texas are caused by humans and so we urge the citizens of the state to be extra careful when they're out, outside," Stanford said. It's a sentiment echoed by volunteer firefighters. "Do not burn at all we're still under a burn ban in Brazos County and there's absolutely no burning," said Will Maddux. 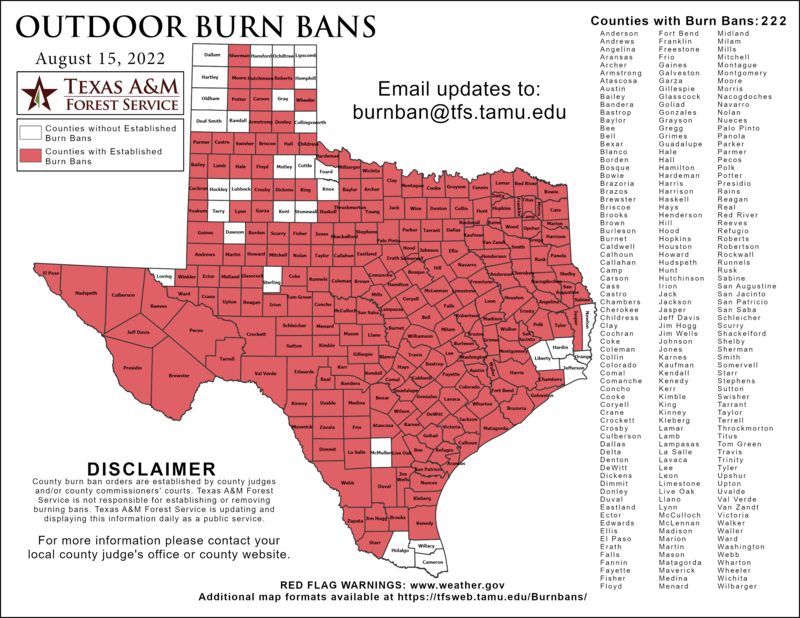 There's no burning here and within another 184 counties across the Lone Star State. Volunteer firefighters now said they believe Monday afternoon's fire in west Brazos County was caused by an illegal burn. Firefighters from Bryan were also called in to prevent the fire from spreading to area homes and buildings.